Dr. Ron Paul's rEVOLution continues with George Brikho 2014. 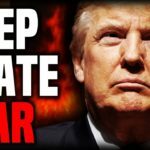 No More Games, Mr. President: Release Deep State Documents Now! I have watched President Donald Trump do many great things for our nation, but we need to make sure to stay on him so he does not go astray as many have within our corrupt political system. He is still a man, he is under an incredible amount of pressure, and we must pray for him as well as stay on him when he is making mistakes. This is how we can exert our power as political activists and help make America great again. Right now, Trump is making a mistake by refusing to declassify certain government documents that would expose a tremendous amount of corruption at the FBI, Department of Justice and other deep state entities. These documents would reveal Bob Mueller’s special counsel investigation of Russian collusion to be a total farce, but Trump is hesitant to release them. The swamp is in Trump’s ear constantly, telling him that releasing the documents would destroy the prestige of the federal government. They are correct, but this is exactly what needs to happen. The deep state, the military-industrial complex, the international financiers, the globalist cabal, the new world order, or whatever you want to call them are afraid of the sunlight. They operate under the cover of darkness and commit atrocities that we cannot even comprehend. The only way this system can possibly be reformed is for this information to be released to the public. They may say we can’t handle the truth, but we must challenge ourselves to be up to the task. Living in fear and ignorance is causing America a great spiritual and cultural rot. There are unsolved questions about everything that is important in this country, and people don’t talk about it enough. We have been kept in the dark for too long. Going from JFK to Vietnam to 9/11 to Iraq and so on, we have never been told the truth about any major world event that takes place. We cannot be a dumb, servile, weak, pathetic people and expect for God to bestow us with the blessings of liberty. Trump may be our last chance to turn this around, but he must act wisely. He has done a lot for us, but far more is needed! Trump has agitated against the powers-that-be magnificently. He has politicized the issue of the deep state and their treasure trove of secret documents frequently, something that no other politician except for Sen. Rand Paul of Kentucky is willing to do. He deserves credit for that, but he also deserves admonishment for going back on his word. He said he would release documents before the elections, and then recanted. Those documents could possibly have saved the 2018 mid-term elections, which were particularly bad in Michigan for Republicans. Mr. President: This issue is NOT about scoring political points. It is not a political football you can kick down the road to get better deals for your administration. This is about righting the wrongs that have turned America from the greatest country in the history of the world to a laughingstock that cannot even perform the basic functions of a country. This is about our children’s future and whether they live in a world where truth and justice reign supreme. If Trump fails at draining the swamp and the permanent bureaucracy remains in place in Washington DC, America will NEVER be great again. We must call upon him to act, and to declassify all documents that show us how the deep state violates our freedoms. Call the President at 202-456-1111 and urge him to declassify these crucial documents! Thank you for caring about the future of your nation. I always try to keep a laser focus on foreign affairs because it is extremely important and very rarely will the fake news media actually give you the truth about what is happening overseas. This is especially true pertaining to Trump’s recent summit with Putin. 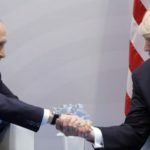 After US President Donald Trump met with Russian President Vladimir Putin in Helsinki last month, virtually every elitist of our entrenched political class hollered the same refrain. They whined about treason, or Russian collusion, or about Putin being a dictator, blah blah blah. They would rather see us go to war with Russia, which would probably be World War III, than see us work together with the country on shared strategic interests. There were very few men with the courage to stand strong with the President for extending the olive branch in times when peace and the settling of tensions are desperately needed. None of those brave folks who stood with the President had a higher public profile than Sen. Rand Paul. Rand Paul arrived in Russia today and continues his Moscow visit right now. He endured an incredible battery of threats and ridicule in order to make this trip. He was on the receiving end of two terrorist attacks from deranged leftists triggered into action by biased mainstream media coverage against the President, one of which could easily have taken his life. His trip to Russia is already yielding results and may go a long way toward rectifying the damage done by the deep state between the two nations. Paul announced today that Russian lawmakers have agreed to visit the U.S. Capitol in the near future. Paul met with Konstantin Kosachev, chairman of the Russia Federation Council Committee on Foreign Affairs, and the two men were able to come to that decision. They both believe that dialogue and engagement between the two nations are incredibly important. If we ever return to normalcy in our relations with Russia, we will owe Sen. Paul a great debt of gratitude. Just like what happened in Iraq, the mainstream media launched a propaganda campaign to demonize Saddam Hussein so the deluded public would accept an aggressive, unnecessary war. They did the same thing to Muammar Gaddafi in the run up to his removal with an illegal war in Libya. They are maligning Putin not because of what he has done in the world. Truth be told, Putin’s crimes throughout the world pale in comparison to our own. We must remember the blood on our own collective hands before we unduly judge others. The powers-that-be are calling Putin the next Hitler is because he stands against the globalist agenda, for his people, for the strength of his nation, and he is willing to ally with right-wing movements throughout the West who have similar goals. Putin may be heavy-handed in how he handles his business, but we regularly ally with authoritarian governments all the time. Just look at our long-standing allies in Turkey and Saudi Arabia, two Islamic dictatorships where Christians are tortured and open homosexuals are stoned. Putin and Trump have similar goals in stopping Islamic terror in the Middle East, and the nations’ economies are very much intertwined in the global economy. Why should both countries not be safe and prosperous? Former President Obama was unable to secure electoral integrity back in 2016, and of course, those along with all other Obama-era disasters should be corrected. It is our responsibility to stop electoral meddling, just as it is Russia’s responsibility to stop any electoral meddling that the United States does. We should not sabotage diplomacy over espionage that is frankly routine and clearly had no impact on the actual result of the 2016 election. This is one of the rare cases where I agree with the former President. Trump won fair and square, and an alliance between Russia and the US should not be sabotaged because of the whining of sore losers. Protecting and strengthening the West is more important than satisfying the unstable emotions of crybaby Democratic cowards unwilling to accept responsibility for their own massive failure in 2016. That is exactly what Putin and Trump intent to accomplish, and these two leaders actually have the king-sized balls to pull it off. Rand Paul is supporting the President and making it easier for him to pull off his heroic foreign policy agenda. We are finally defeating the neocons and returning to a policy of engagement rather than beligerence. This is what we hoped for when we were apart of the Ron Paul revolution. I would recommend all supporters of Rand and his father to rally around President Trump as he does incredible work overseas. Rand Paul could ultimately become the successor of Trump, continuing his legacy, building upon his foreign policy, and finally bringing the troops home from overseas in 2024. This is how we regain the lost momentum of the liberty movement! Time to come together and unify around making America great again. We will unite around Trump in the homeland while Russia and the United States unite to make Western Civilization great again! 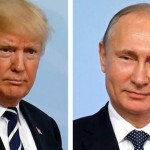 The mainstream media is now up in arms as US President Donald Trump gets ready for a summit with Russian President Vladimir Putin later this month. Those poor souls who are glued to the idiot box think this is a horror. This hysterical propaganda beamed out into the minds of unsuspecting Americans is supposed to make us believe it is the 1950s again, the Cold War is back on, and the red menace is out of control. Nothing could be further from the truth. This propaganda can only be believed by desperate fools with no concept of the American foreign policy status quo. In actuality, Russia is heading in the right direction – toward free markets and toward a strong nation while embracing traditionalism and rejecting degeneracy. Like Syrian leader Bashar al-Assad, Putin stands firmly for his people and that is why they love him or it. Putin will not sell his people down the river at the behest of a global cabal of thieves, murderers and pedophiles. He is a natural ally for Trump, as the men share many strategic goals. The goal that is most important for both of these men to achieve during their summit is peace in Syria. The last time that Putin and Trump ‘colluded’ was in Syria to defeat ISIS. After Trump reversed the policy enacted by Barack Hussein Obama that was funneling the weapons into the hands of terrorists in Syria, ISIS was quickly dispatched. 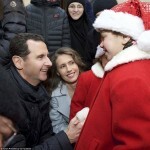 As a result, the Syrian regime under Assad was strengthened and the Christians of Syria will continue to get safe haven. The genocide of Christians has been thwarted, and radical Islam has been repelled. Of course, there were many casualties in Syria during the civil war. Many people lost their lives fighting to run ISIS and other terror groups out of the region. The Russian and American forces who dropped many bombs certainly contributed to that carnage, and that cannot be discounted. War is hell, and blood is on the hands of everyone who participated. The United States – who propped up Al Queda and ISIS in Syria under the Obama regime – committed atrocities. But now, we have the chance to finally do the right thing under President Trump. We finally have the chance to reverse course. This is the miracle we have all prayed for. Nevertheless, it has been a rocky road with the Trump administration. President Trump has advisors such as General John Kelly, General James Mattis and Bush-era neocon John Bolton who are constantly in his ear telling him to keep troops in the Middle East. Trump has even flirted with arming the Kurdish rebels in Syria, which has sent our strategic partner Turkey into a frenzy as a result. Trump even recently continued the funding of the White Helmets, the Al Queda re-brand that gets a Hollywood propaganda push to support terror groups in the Middle East. These are missteps that the President quickly needs to remedy if he wants to truly reverse the damage caused by Obama, Clinton and Bush. Trump’s policies have been far from consistent, and he has certainly made mistakes. Trump’s instincts are sound though. He knows these Middle Eastern wars are nonsense and has expressed those sentiments many times. He called the Iraq War the worst disaster in history. I can affirm from the experiences of my own family and friends that Trump tells the truth in that assessment. His natural instincts are to spend money on American interests and stay out of foreign entanglements. His recent shocking progress toward peace in North Korea shows Trump’s diplomatic brilliance and iron will. Trump needs to duplicate that iron will when dealing with Putin. He needs to muster the courage to ignore his establishment-leaning advisors and come together in a show of strength with his Russian counterpart. He needs to announce peace in Syria, and work with Putin to make sure that Iran comes together with the US to make a new deal. A new deal where Iran is actually made to comply with the terms unlike last time. This way, we can ensure safety in the Middle East without resorting to another bloody, costly and counter-productive war. The globalist elite will do everything they can to sabotage Trump and his diplomatic efforts, of course. They will stage false-flag attacks and blame Assad for them. They will make up lies, cast aspirsions, fake poisonings, use children as political props, and anything else they can imagine in order to keep the US presence in the Middle East. Genocide is their business. Dropping bombs onto wedding parties and funeral processions is their modus operandi. Keeping the war machine going for whatever reason – on behalf of the defense contractors, the deep state, DoD bureaucrats, and other vulturous interests who feed from the military-industrial complex – is their goal. Trump has a chance to throw a wrench into this satanic system with the world’s most powerful and respected leader by his side. He must take this opportunity and strike while the iron is hot. As we saw with President John F. Kennedy who tried to take on the CIA and Deep State of his day, Trump’s time as President may be limited. He must not hesitate in establishing a lasting peace in Syria. This can be his enduring legacy – far better than anything any President has done in a generation. The two leaders are expected to meet on July 16 in Helsinki, Finland. ACTION ALERT: Call President Trump’s office and urge him to work toward peace in Syria at 202-456-1111. TRUMP SUPPORTERS — We Must Stop Disaster In Syria! As many of you know, I supported Donald Trump for President in 2016. I did so for a variety of reasons, and do not regret it. I knew he was not perfect but could tell he was not apart of the establishment gang. He spoke truth to power, and it was refreshing. His foreign policy was the best of all. Trump regularly called out George W. Bush. He called out Republicans. He called the Iraq War the worst policy in history. He wanted to spend the money we waste abroad on wars in the homeland to build up America and Make America Great Again. This was what he espoused on the campaign trail, but that has changed now that he is in the White House. Trump is losing his way and embarking upon similar policies as his predecessors. There was incredible progress in Syria that was achieved in 2017, and it is now in jeopardy. Trump reversed the policies of Barack Hussein Obama that were funneling weapons to ISIS and other Muslim terror groups to dispose the regime of Bashar al-Assad. This allowed Assad along with the Russians to decimate ISIS in the region. Without ISIS around as a threat, there is no longer a bogeyman in the region that can be used to justify endless war. That is why the complicit Western media has made Assad and Putin — the men who literally saved the world from ISIS — into the new bogeymen. Trump’s recent bombing of Syria and the Assad regime only helps ISIS. He is playing into the hands of his enemies. The only way ISIS can gain a foothold in Syria is if Assad is disposed from that country. Assad is the protector of Christians in the region. Assad is the crusher of radical Islam in the region. Compared to other rulers in the Middle East, he is not repressive. Our “strong ally” in Saudi Arabia, for one example, is far more brutal than Assad by every possible metric and commits war crimes in Yemen that dwarf anything Assad has ever done. This hypocrisy is pushed by the Western media to drive the war machine, which won’t be happy until the entire Middle East is on fire and America is looted completely. What has made me particularly sad and disgusted is to see many Republicans and many Christians falling for these lies. Self-professed followers of Christ cheer as the man who protects Christians in Syria from slaughter is framed for chemical attacks he did not commit and bombarded for no good reason. So-called Republicans who elected Trump to make America great again and put America first now support the exact same failed policies of Bush and Obama. Why does the American public refuse to learn? Why are Americans so willfully ignorant of basic facts? This collective amnesia allows America to be abused like a two-dollar whore by the globalists, and Trump is apparently ill-equipped to stop them. Trump has already set a dangerous precedent with his unauthorized strikes of Syria, but now he needs to stop. Trump has said ‘Mission Accomplished’ but that does not mean the dangers have subsided. There are powerful interests that want us to remain in Syria for a long time, and they are leaning on Trump to get their way right now. The Israeli government, for instance, wants us to remain in the region to fight Iran and Syria on their behalf. Israel is a first-world nation with a massive military, and they can defend themselves. It does not benefit America to launch wars in Syria or Iran, and Trump was elected to put America first not to put Israel First. We saw how disastrous our wars with Iraq and Libya turned out to be. We have to resist the lies and urge others to do so. Call President Donald Trump at 202-456-1111. We have to blow up his phone. Make several calls and encourage others to do so. Trump will respond to pressure, but we have to be firm. We have to hold Donald Trump to his campaign promises. I supported him from the start, but understand that we elected him to be a servant leader. As Americans, we support a Constitutional system with checks and balances. We must remember our principles. We must remember that it is important to hold government officials accountable as our forefathers did. We must demand that Trump do the right thing, and avoid another grizzly unnecessary war. Remember your mandate, Trump, and get back to work fighting the globalists rather than parroting their talking points. A Call To All Christians: Reject The False Flag And War Propaganda In Syria! I have to alert you today about the atrocities that are happening in Syria right now. Bashir al-Assad, the long-time President of Syria, was locked into a war against outsiders. These foreign terrorist groups were being armed with American taxpayer dollars by the CIA at the behest of Barack Hussein Obama to lay Syria to waste and make it a haven for radical Islam. ISIS was growing because of these policies. As soon as Trump became President, he reversed these policies. This allowed Russia to pulverize ISIS into oblivion. ISIS is virtually wiped out because of the actions of President Trump, Vladimir Putin and Bashir al-Assad. God bless these three men and their heroism. They may not receive peace prizes in this evil world, but they will receive their glory in the next life. Sadly, the fight is not over. There are interests out there – whether you want to call them the globalists, the deep state, the military-industrial complex, the banksters, or whatever – who want Syria to be laid to waste. They want a genocide in Syria like what happened in Libya. They want atrocities to happen in Syria like what happened in Iraq. All so they can line their pockets with blood money in the midst of the ruins. The Syrians have suffered enough, and over this weekend, there was a false flag attack in their country. Although it was not covered by the western media, the Russians warned of the false-flag attack weeks in advance. The chemical attack happened in the region of Ghouta where they claimed the event would happen, bolstering the credibility of Russia’s prediction. The alleged incident was reported by the “White Helmets,” which is nothing more than a re-branded division of Al Queda. World War III almost started today after Israel bombarded Syria, targeting Syrian and Iranian forces in the attack. Trump has vowed retaliation against Syria for unproven chemical attacks, and he has apparently bought into the lie this time around. This is the Cuban Missile Crisis all over again. The world is in peril, and we must not fall for the deception once more. We must not be drawn into another illegal, immoral, senseless war in Syria. The Christians of the world must speak out and take action! Bashir al-Assad protects Christians from genocide in Syria. He is a secular leader who fights radical Islam. We owe him a debt of gratitude for fighting and defeating ISIS so valiantly. We cannot allow our corrupt media elites and deep state government officials to slander him, frame him for attacks that he clearly did not commit, and use that lie as a pretense to go into another war. CHRISTIANS, IT IS TIME TO STAND UP! We have to stop an atrocity that will directly harm Christians. Christians in Iraq were ethnically cleansed from their lands following the War in Iraq. Libya went from Africa’s top country to a haven for human trafficking, terrorism, slavery and child abuse. We cannot allow that to happen in Syria. Please tell others about these facts I have brought to light and call President Trump. Call President Donald Trump at 202-456-1111 and urge him to resist the propaganda. Tell him to stick to his instincts. He wanted to leave Syria a week ago, and now this false-flag attack has made him reconsider his initial decision. Tell him you voted for him to stand strong against the swamp, not to succumb to it. This is a make-or-break moment, and we need to tell Trump to stand for Syrian Christians and their protector Assad against the deep state and the war party. The future of the Western world may depend upon it!